Recently the weather has been anything but spring-like, which has left me craving warm weather and the fresh produce that comes with that elusive season. And nothing says spring like the smell of fresh strawberries wafting through the kitchen. Warning: the smell of these muffins is seriously intoxicating. 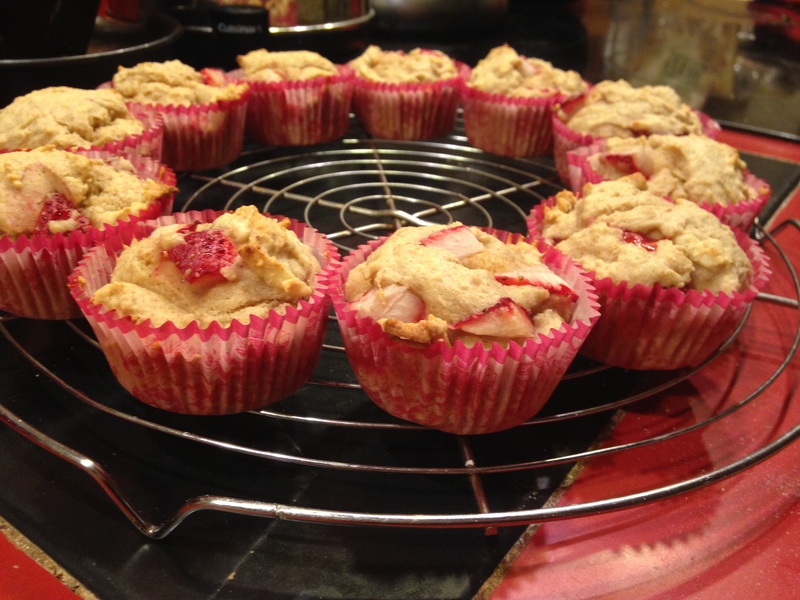 As in, when I pulled them out of the oven, I was enveloped by the enchanting aroma of strawberries. And not the saccharine “strawberry” flavor sometimes attached to cheap candles that is slightly reminiscent of cough medicine. No, this is the real deal, close-your-eyes-and-be-transported-to-fresh-strawberry-paradise smell. It’s the kind of smell that makes me want to wax poetic about the beauty of farmer’s market produce (c’mon, spring!) and start singing a certain song by the Beatles as I run across a sun-drenched field…but I digress. 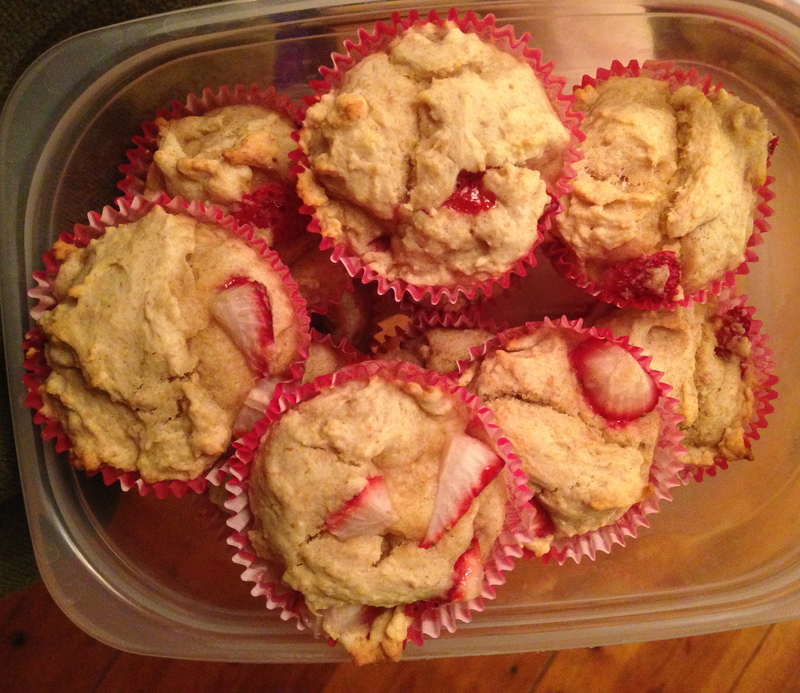 In case the smell alone isn’t enough to convince you to make these, try the fact that they are half whole wheat (if you haven’t guessed already, I hate making things with all white flour), free of refined sugar, and have a kick of protein and a subtle crunch thanks to the almond slivers that compliment the sweetness of the strawberries perfectly. These muffins are perfect as a filling snack, a dessert, or to make ahead for breakfast on the go. Go forth and bake! Note: I chose to use flax milk because it is the lowest calorie, but you can substitute your preferred non-dairy milk or skim milk if you don’t have it. Preheat the oven to 400 degrees fahrenheit. In a medium sized bowl, combine the earth balance with the agave. Add the egg and mix well. In a separate small bowl, combine the flours, baking powder, and salt. Alternate adding the flours/baking powder/salt mixture and the flax milk to the agave and earth balance. Add the vanilla extract and mix thoroughly. You should be left with a stiff batter. Carefully fold in the strawberries and slivered almonds. Spoon the batter into a muffin pan and bake for 12-15 minutes. Makes 12 muffins.